Who Are the Enemies of Scarlet Macaws? 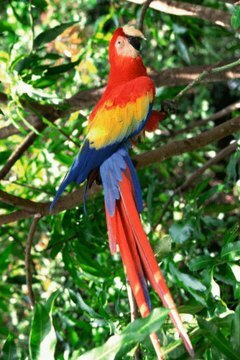 The scarlet macaw is a brilliant, red, blue and yellow parrot which is found throughout Central and South America. As of 2011, the U.S. 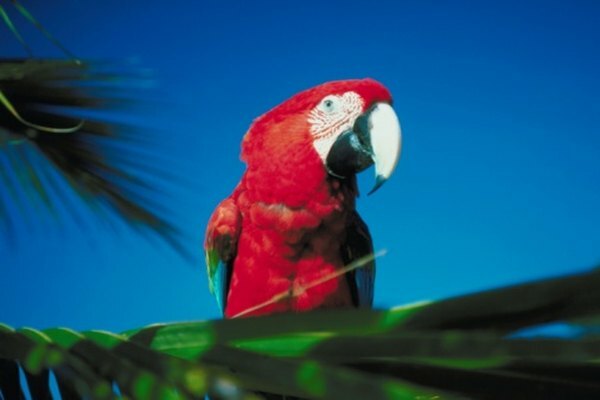 Fish and Wildlife Service does not have the scarlet macaw listed as an endangered species, but its status is under review. The Convention on International Trade of Endangered Species, includes the scarlet macaw in its Appendix I, meaning that the species is threatened with extinction and that its trade should be highly regulated. Humans are the scarlet macaws greatest threat, both through poaching and habitat destruction. Scarlet macaws are hunted for food and for illegal trade. Each bird can be sold for as much as $1,000, so the incentive for trappers is high. In order to access a nest, some hunters will cut down the tree in which it is built. Although the adult birds may escape, the destruction of their nesting site can discourage future breeding. Deforestation is also decreasing scarlet macaw numbers by limiting their habitat. Raptors, such as hawks, falcons and eagles, pose a threat to scarlet macaws, particularly when the macaws leave the safety of the trees to feed on clay banks. The minerals in the clay are essential to their diet, so scarlet macaws frequently visit clay banks, often doing so in a flock to decrease the risk. Surveillance cameras set up by the World Conservation Society to observe scarlet macaws in Guatemala revealed that the collared forest falcon was the greatest threat to young macaws in that region, as it would steal fledglings from their nests. Scarlet macaws occasionally fall prey to jaguars and other large cats. To insure their nests are not vulnerable to this type of predator, macaws prefer to build their nests 100 feet or more off the ground. This is why the deforestation of ancient rain forests and the destruction of prime nesting sights by poachers is particularly problematic. Even under ideal circumstances, scarlet macaws are not prolific breeders. Inability to find a safe nesting site further decreases the likelihood they will breed. Monkeys, toucans and snakes sometimes prey on fledgling scarlet macaws or steal eggs. Adult birds are not at risk from these small predators, since they can fly to safety.